Zhou Weijie will never forget the date Aug 26, 2010. While the 21-year-old law student from Anhui University of Technology was crossing the street late that afternoon, a taxi knocked him down and he became unconscious. In the following months, Zhou underwent one treatment after another, and the hospital bills piled up to 200,000 yuan ($32,000), until he came out of his coma. Although Zhou got back his life, he was paralyzed below the waist. Zhou says his parents borrowed 150,000 yuan from a loan shark to pay the medical bills. As it was a hit-and-run case, the family could not claim compensation from the taxi driver. Insurance company also rejected their claims because of the lack of legal proceedings. During the family's most desperate moments, Gao Guangliang - Zhou's law professor, who is also a partner with a legal aid center in Ma'anshan city in Anhui province - came forward to lend a helping hand. "I visited Zhou and his parents soon after the accident and asked whether they needed free legal support. I reckoned the family must be going through a hard time, both emotionally and financially," Gao says. His center provides free legal assistance to those involved in a legal case, but cannot afford to hire a lawyer. Among their target clients are teenagers, migrant workers and people with disabilities. With Gao's assistance, the local traffic department managed to find the taxi driver and claim part of the medical expenses from insurance company. In April 2011, eight months after the accident, the case was brought before the court. Zhou and his family received 927,648 yuan ($150,000) of compensation in total. "We successfully won the case, but the money is just a small compensation for Zhou," Gao says. Both Gao and the legal aid center in Ma'anshan receive funding from the China Legal Aid Foundation, established by the Ministry of Justice in 2009, which provides legal support for the elderly, women, children, people with disabilities and migrant workers. During the past years, the center has provided free legal assistance to 170,000 people involved in 100,000 cases. "We have several main methods of reaching out to those in need of help, such as cooperating with legal aid centers in cities and NGOs," says Zheng Xiaze, secretary-general of the foundation. He says during the past years, their largest group of clients has been migrant workers, as the number of people leaving their home villages to work in cities soars. For Zhou Weijie, the life-changing accident changed his outlook on life and he is now clearer about his vocation. 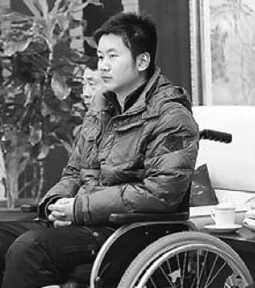 "Before the accident, my goal was to study hard and get into a law graduate school," says Zhou, who has been dependent on his wheelchair for more than two years now. "Now, I think it is more important to put what I have learned to help those in need. I used to think that only the disadvantaged need free legal aid. But I realize from my case that everyone of us can become vulnerable."